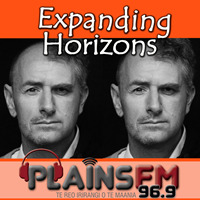 Expanding Horizons was born from a plethora of conversations between two work colleagues who came to a simultaneous realisation that there was so much each of them was missing out on in the world of music, film, art, culture and indeed the intriguing stuff that people do. So, what could be better than sharing their combined enthusiasm with the people of Canterbury on a radio show that is committed to expanding knowledge, experience and providing others with a platform to promote the things they’re in to; things that might usually go largely unnoticed by the masses? Hosts Colin Hill and Stu Gilpin are both educators. Colin has his own emerging band and can be regularly seen at local gigs; usually to the side standing by himself. Stu is a filmmaker/reviewer and can regularly be seen at movie theatres; usually to the side sitting by himself. Together they like to question, challenge and take a few risks. They live by the Frank Turner lyrics, “Get up and get down and get outside” and their show reflects this mantra. We look in depth at The Jams 6th and final studio album, 'The Gift'. We celebrate the worst songs ever. They're popular, just bad. We enjoy a selection of music from different months of the year. We look at New Year Traditions around the world and play some sing-a-long favourites! We play the songs of the Newtown Neurotics. A largely unheard of gem of a band. From the second wave of punk, straight out of Harlow, Essex, with a mind and a heart. We have some fun with a kaleidoscope of psychedelic rock. Natalie from Delta joins us to talk about upcoming events. We also recognise thanksgiving with a bit of Americana. Young musician, Olivia Eady, chats about her influences, aspirations and plays live! We play some XTC favourites. You'll be in XTC! Local teenage musician Archie chats and performs live. We celebrate Halloween with some great gothabilly music.